You are here: Home / Health & Diet / How To Reduce Salt Intake To Control Hypertension? How To Reduce Salt Intake To Control Hypertension? A blood pressure of 140/90 mmHg or more is usually referred to as hypertension. Here, 140 represents the systolic pressure and 90 represents the diastolic pressure in arteries. Generally, a blood pressure of 120/80 is considered normal. Basically, hypertension or high blood pressure is a chronic condition wherein the blood pressure in the arteries is elevated. It is considered dangerous because it can contribute in causing heart disease, kidney disease, and stroke because the increased pressure induces the heart to work harder, thereby causes serious damage to the arteries. If left untreated, it may damage the lungs and brain, too. This common condition, however, is not easily diagnosed as it does not cause serious symptoms in most people. In fact, the signs and symptoms of high blood pressure tend to differ from one individual to another. Nevertheless, this silent killer is likely to cause shortness of breath, anxiety, severe headache, nausea, fatigue, nosebleed, irregular heartbeat, blurry vision, dizziness, and loss of consciousness when the blood pressure is abnormally high. The condition may be caused by issues like kidney disease, tumors, prolonged intake of contraceptive pills, or due to unknown reasons (Essential Hypertension). Moreover, factors like aging, stress, smoking, obesity, sedentary lifestyle, frequent or high alcohol consumption, vitamin D deficiency, thyroid disorders, diabetes, genetic predisposition, etc. also tend to raise the risk of developing this problem. In addition, sodium increases the blood pressure as it causes water retention in the body. Thus, apart from taking the necessary medications, it is essential to limit the amount of salt in your diet in order to control hypertension. The American Heart Association, thus, recommends an intake of 1,500 mg or lesser amount of sodium per day. 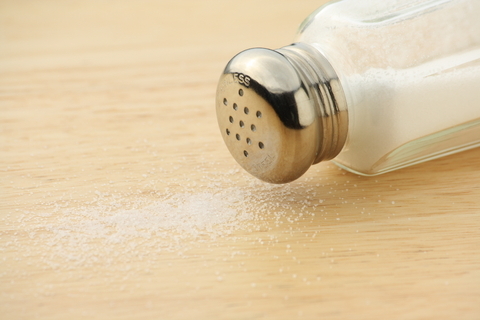 On an average a teaspoon of salt contains about 2,300 mg of sodium. Apart from salt, sodium is naturally present in various foods like celery, beets, milk, etc. in small quantities. Plus, it is suggested that take a balanced diet and include a variety of fresh fruits, vegetables, and whole grains to manage hypertension and stay healthy. Besides, make lifestyle modifications by regularly engaging in physical activity and exercise. • Look for healthier alternatives to salt. For instance, consider using lemon juice, lime juice, chilies, dill seeds, jalapeno, cayenne pepper, dried parsley, dried thyme, dried marjoram, dried savory, dried paprika, dried chives, cinnamon, basil, cloves, oregano, mustard seeds, nutmeg, onion/garlic powder, ginger, vinegar, and so on while cooking. • Do not add additional table salt in your food. In fact, it is better to replace your table salt with herbs, spices and salt-free seasonings like hot sauces, black pepper, lemon pepper, etc. • Stay away from processed foods such as lunch meats, canned soups, canned seafood, and so on. If you cannot avoid these foods completely then at least opt for low sodium products. • Use unsalted butter, and munch on unsalted popcorns, unsalted nuts, and plain crackers instead of salty potato chips. • Read the food labels carefully and choose the ones that are low in sodium. In case the pack does not mention the percentage of sodium in the food then avoid getting items containing ingredients like Monosodium glutamate (MSG), Disodium phosphate, Sodium nitrate, and Sodium alginate, baking soda, and baking powder. • Add low-sodium foods such as spinach, carrots, cucumbers, peas, lentils, dried beans, cabbage, broccoli, green peppers, rice, puffed rice, pastas (do not add salt while boiling pasta), granola, and rolled oats in your diet. As for fruits, consume apples, peaches, watermelons, oranges, tomatoes, cherries, blackberries, and so on. • Go for low sodium cheeses such as Monterey, Mozzarella, Swiss, cottage cheese, etc. • Include potassium-rich foods such as potatoes, sweet potatoes, soybeans, artichoke, winter squash, kiwis, bananas, avocados, apricots, dates, raisins, and other similar foods in your diet because it helps decrease sodium level in the body. • Rinse high sodium foods like canned vegetables in fresh water before consuming. Interestingly, although it is believed that caffeine contributes in raising the blood pressure, it is not a proven fact as scientific studies have not found any such link. Nevertheless, restrict your caffeine consumption (coffee, in particular) as it should not be taken in excess.